What a pleasure it was to see an exhibition in King’s Cross that reinvigorates one’s love of art with its potential to engage the senses. Such a show has just finished at Gagosian on Britannia Street with a collection of Rauschenberg’s Jammers available to see as a group of sculptures largely made with textiles arising out of his travels and changes in his life. 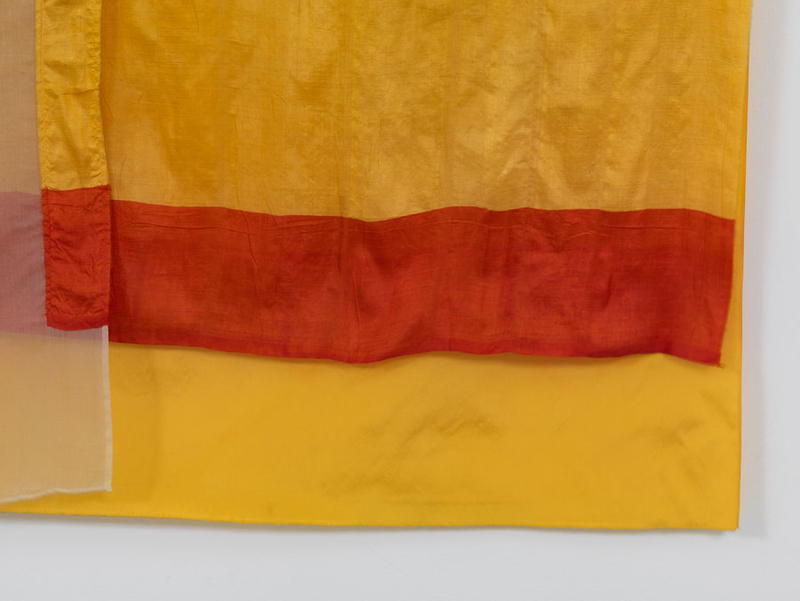 Taking inspiration from Jammer sailing boats in Florida and fabrics that he saw on a residency in India during the 1970s, the artist shifted direction from his seminal combine paintings. These soft, draping sails dispense with Rauschenberg’s early humour found in the rather jaundiced and ironic assemblages. The Jammers feel more invested with romance and an unrestrained enthusiasm. As such, they seem more instinctual and less premeditated. The hand seems to determine the outcome rather than a thought process. Stemming out of twin activities of sailing and weaving, the works assume an autonomous quality without wholly dispensing with reference to practical activities. Essentially, these works possess an open inquisitive quality that invites you to simply enjoy their material richness of texture, colour, overlay, crease and rhythmic threading. By turns limp and taut, the Jammers cross the line between image and object. In assembling materials together such as muslin, silk, rattan, tin cans and mud, Rauschenberg begins to construct assemblages of spare rigour and aesthetic power. On a cold, bleak day in central London these Jammers hint at tradewinds and spice, of tropical life determined by movements of the sun and wind and colours derived from earth and plants. Perhaps the most seductive piece shown in London was a ‘jammer’ made from moulded grass and mud that carried its organic origins in the scent gently emitting from the object propped against the gallery wall like a talisman. It hinted at farmyard dung but Rauschenberg has crafted this unidentified base material into a sculpture redolent of the elements of earth, wind and water that retain their raw presence in the gallery despite the sculptor’s intervention.